All below stated information is considered the copyrighted work of ComGate Payments, a.s., and the business secret of ComGate Payments, a.s. Therefore, thank you for the discreet and correct treatment of the information stated in this document. ComGate Payments system provides different payment methods to the Merchant. The document shows how to integrate merchant’s web site with ComGate Payments system. The intended audience is software developer. ComGate Payments provides payment solution for Merchants’ websites and business applications. Communication between Merchant and ComGate Payments is based on HTTPS protocol standard. While making payment, Payer is redirected from Merchant’s website to ComGate Payments. After making payment Merchant is (optionaly) informed about payment result and Payer is redirected back to Merchant’s site using standard HTTP redirect. Payer is redirected to ComGate Payments instruction page and fills in remaining required fields. If all required fields were provided by Merchant the ComGate Payments instruction page is skipped. Payer pays required amount using Payment provider’s interface and is redirected back to Merchant’s site. The redirect is made transparently through ComGate Payments system. If the payment was successful, the Merchant provides the goods/service to the Payer. This step is optional but it is recommended to implement it in every case you need to be sure that the payment is created secure way and without possible Payer intervention. It also ensure unique linkage of payment to order. Omitting this step is applicable only if e-shop do not need a system to identify each payment, but just needs an information that anyone paid any amount. For classic e-shops, where you pay for a specific good is skipping this step naccessible . Merchant uses HTTP request to create payment transaction. Payment attributes including unique payment reference number are sent as POST parameters by HTTP protocol. Communication is only between Merchant’s server and server of ComGate Payments and is invisible to Payer. So Payer is not able to change payment parameters. ComGate Payments server responds by sending unique payment transaction identifier – Transaction ID (ComGate Payments identifier) and URL to redirect Payer to. Communication between Merchant’s system and system ComGate Payments is secured using password and IP whitelist (access is allowed from predefined Merchants IP’s only). It is strongly suggested to use HTTPS protocol that is safe to not reveal password even if communication is intercepted. Password is sent as HTTP POST parameter (not GET parameter) for not to be stored in communication logs of webservers. If previous optional, but more securing step is used and payment transaction is already created that way, it’s Merchant’s webserver task to redirect Payer to URL address that was returned in ComGate Payments system’s HTTP response. If the first optional step is omitted, Payment transaction is created after Payer is redirected from Merchant’s server to ComGate Payments server or by posting web form from Merchant’s website to ComGate Payments server. Payment attributes, including unique payment reference number are sent using HTTP protocol as POST or GET parameters. This communication is not secured so it is possible for Payer to change payment parameters if you nacces the first optional step. Implementing this part ensures automatic transmission of status of each payment transaction directly to your server at the moment the final status is known. If you are satisfied with e-mail notifications about payments and possibility to use ComGate Payments website interface to see information about payments, you can skip this step. Payment status is delivered to Merchant using HTTP request from ComGate Payments system directly to Merchant’s server. Identifiers and payment status are sent as POST parameters using HTTP protocol. This is background communication so it is naccessible to Payer which is unable to fraud it. Payer is redirected back to Merchant’s website while Payment transaction identifiers are sent as GET parameters of HTTP protocol. Any Goods or service providing must be based on the background payment status handover. It is not safe to rely on the Merchant’s website URL to which the Client is redirected because it is really easy to fraud. Communication between Merchant’s system and system ComGate Payments is secured using password and IP whitelist. Access has to be allowed from range of ComGate Payments IP addresses only. This range is defined as 89.185.236.55/32. It is strongly suggested to use HTTPS protocol that is safe to not reveal password even if communication is intercepted. Password is sent as HTTP POST parameter (not GET parameter) for not to be stored in communication logs of webservers. Merchant assures that the goods (service) provided in the scope of payment transaction (identified by unique transaction ID) is provided only once. Even in case of multiple background calls with the same transaction ID. It’s Merchant’s own responsibility to somehow register, using his system (database), that the goods (service) were already provided. Merchant is also responsible for providing right goods (service) only to Payer who made the payment. It means that Merchant registers linkage between transaction ID and Payer ID in his system (database) after authentication of Payer on Merchant’s website. Another way is storing any unique identifier in session (cookie) of Payer’s browser and pairing this identifier to right transaction ID. The result of payment is not yet known at the time of redirection of Payer back to Merchant’s website. Payment is at the PENDING status. This is the common situation and Merchant can’t present this status as a failure. System is either waiting for crediting payment to bank account or to confirmation from Payment provider, ie. bank or mobile operator. Final payment result is communicated to Merchant later. It is done either by sending result of payment by background server communication or by sending him email. Next source of payment status information is ComGate Payments website. If the ComGate Payments system knows the result of payment instantly, Payer is redirected to the URL (PAID or CANCELLED). If Merchant implemented handover of payment transaction on background, redirection to Merchant’s website is made after the successful handover of payment transaction result on background. It is not possible to provide ordered goods or service to Payer just based on URL to which is returned. It is easy to fraud payment transaction result this way by making browser to request to changed URL. Merchant have to implement receive payment transaction result on background or manually check at ComGate Payments website that the payment was really made. PENDING – payment transaction was created, final result of payment is not yet known. PAID – Payer successfully realized payment – it is possible to deliver goods, provide service. CANCELLED – payment was not realized, goods or service is not provided. At exceptional cases it is possible for this state to turn to PAID state. Only the payment transaction at state PAID can be considered as really paid. PENDING state is not final and it is possible to switch to state CANCELLED. ComGate Payments payment system allows creating, submitting and canceling preauthorization of card payments. Payment creation has standard process, only parameter preauth=true must be specified. After that, payer passes the same process as in case of normal payment. After entering card detail to the payment gateway, relevant amount is blocked on his credit card. Depending on result of this operation, payment passes either to special state AUTHORIZED, or in case of rejection to state CANCELLED. This state is reported in background by usual process described above. To actually deduct the money, Client calls function for submitting preauthorization. If money are supposed to be released (eg. it is not possible to fulfill conditions of purchase contract), client calls function for cancelling preauthorization. ComGate Payments system also allows entering recurring payments. Recurring payments allow payer to make quick payments with one click. First (initial) payment is a standard process with redirection to the payment gateway; the following payments are being done completely on background. The system allows payer to pay within seconds without need to fill in his credit card information. This functionality is available on request for clients when accepting card payments via providers ČSOB pr Česká spořitelna. In case of recurring payments, it is necessary to establish initial payment at first. This payment is a standard payment with initRecurring parameter set to “true”. Subsequent recurring payments are established with new method and are bound to initial payment by ComGate ID. This ID must be tied to a particular payer in client system! After establishing recurring payment, payer is not redirected to payment gateway, because the whole process runs in background. Payment’s state is passed to clients system and then shown to payer. If the Client wants to use recurring payments in the future, but wants Payer to „register“ now, he can use verification transaction. If parameter “verification” is set to “true”, standard initial transaction is established, but is automatically refunded after being paid. In terms of recurring payments, this transaction appears to be standard initial transaction; subsequent payments are bound to verification transaction. Notice! Because of bank limitations, it is not possible to combine preauthorization and recurring payments. Testing of implementation is possible by setting parameter „test“ to value „true“ at payment creation. 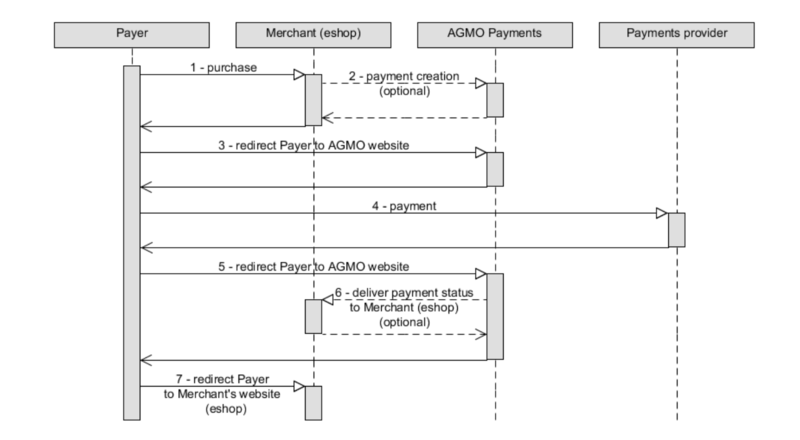 For testing Merchant’s system functionality Payer redirection to bank is switched of. Instead for this purpose we provide virtual provider (bank) where Payer only chooses to pay or not to pay. List of testing payments, e-shop connection settings and communication logs are available here. Access data is sent within welcome e-mail. Merchant is responsible for thorough testing of his system. Even if in production it is still possible to utilize testing environment. Testing and commercial payments are distinguished by parameter “test” at payment creation. Payment transaction creation in ComGate Payments system. It is possible to choose payment method by your system or let the Payer to choose one later. It is possible to do it both ways for every single payment transaction. If the payment method or some other parameters are not set by your system, Payer can set such parameters himself. Payer can do it on payment instructions page of ComGate Payments system. If parameter initRecurring is set to true, initial recurring transaction is set. After that it is possible to create recurring payments that will be linked with this initial transaction’s ComGate ID. Response parameters do not change in this case. Creation of initial transaction is possible only for Clients, who have this service enabled and accept card payments via providers ČSOB or Česká spořitelna. Parameter “verification” is related with initial transactions. When set to “true”, verification transaction is established. Once the payment is paid, it will be automatically refunded. It is not necessary to manually refund this payment. Otherwise this verification payments works the same as standard initial payment. Because of bank limitations, it is not possible to combine preauthorization and recurring payments. Access is protected by IP addresses validation and integrity of the transmitted data is secured using https protocol. country sting N The „true“ means to create payment as testing, „false“ means create payment transaction as production one. If missing, payment transaction is set as production. vatPL string (Y) Identifier of VAT rate in Poland for the payment. Parameter is required only for “MPAY_PL” payment method. cat string (Y) Identifier of payment category. Attribute must have value from list given on integration process. Usually „PHYSICAL“. Parameter is required only for “MPAY_CZ” and “SMS_CZ” payment methods. secret string N For payment transaction creation on background set this attribute to password for background communication. For payment creation by redirection or web form post leave it empty or not set it at all. preauth boolean N If you want to preauthorize card payment, set this parameter to “true”. In case of regular payment set to “false” or keep blank. Only for card payments. embedded boolean N This parameter is used only in combination with method CARD_CZ_CSOB_2. Value “true” ensures that ČSOB payment gateway will be displayed in iframe. To view standard gateway, leave parameter blank or enter value “false”. This functionality is a special permit. ComGate Payment Gateway allows Client’s own choice of payment methods through a simple expression sent in “method” parameter. This expression is always evaluated on the basis of Client’s allowed methods. Permitted method identifier delimiters are “+” for imputation method and “-“ for subtraction method to/from selection. ComGate Payment Gateway allows Payer to have pre-selected one method when accessing gateway. The only thing to achieve this behavior is to redirect Payer to gateway with received redirect URL that in addition contains parameter “method” with selected method. After redirecting to gateway, Payer would have already checked method CARD_CZ_CS, although he can still choose another method. This function is useful only for payments created with methods BANK, BANK_ALL or with own methods selection. ČSOB payment gateway enables optimalization for iframe. This functionality is useful if you don’t want to redirect Payer to payment gateway, but display it in your own system. This functionality is only available for method CARD_CZ_CSOB_2 and Client must apply for permit. Creation of recurring payments to ComGate Payments system is only possible when accepting card payments via provider Česká spořitelna or ČSOB and Clients, who have this functionality enabled. First (initial) payment is made the standard way (see Payment transaction creation). Process of setting second and subsequent payment runs completely on background, these payments are tied to initial through ComGate ID of initial payment. This ID must be in request parameter initRecurringId. Status of payment is shown to payer in client system as result of the process. test boolean N The „true“ means to create payment as testing, „false“ means create payment transaction as production one. If missing, payment transaction is set as production. price integer Y Product price in cents or pennies. Must be min. 10 CZK (including), max. unlimited. payerld string N The Payer identifier from Merchant’s system. The identifier must be verified for example by Payer logging to the Merchant’s system using a password, otherwise leave the parameter blank. It is used when paying with ČS card, where ČS payment gateway stores the card numbers, so the next payment Payer need not reenter the card number. This feature must be enabled for a particular Merchant in the ČS system. prepareOnly boolean Y Set it to „true“ for payment transaction creation on background. For payment creation by redirection or web form post set it to „false“ or not set it at all. secret string Y For payment transaction creation on background set this attribute to password for background communication..
initRecurringld string A ComGate ID of initial payment. All parameters are urlencoded, as in case of HTTP request for Payment transaction creation. Response has parameter code, under which client determines what result he displays to payer. Code = 0 means success and payment was created, any other code indicates error and therefore payment was not created. transld string N Alphanumerical unique identifier of transaction - transaction Id. Will be shown to Payer while making payment. ComGate Payments system passes the final result of payment transaction using HTTP request to Merchant’s server. Parameters of the request describe the detail of finished payment. rest boolean Y The „true“ means payment was created as testing one, „false“ means payment was created as production one. refld string Y Referral payment ID from Merchant’s system. payerld string N The Payer identifier from Merchant’s system. vatPL string (Y) Identifier of VAT rate in Poland. cat string (Y) Identifier of payment category. method string N Payment method used. It is one from the list of payment methods. account string N Identifier of Merchant’s bank account. In case that Client created payment with requirement to preauthorize credit card payment (using the parameter preauth=true), calling this function will require the deduction of money that were blocked within the preauthorization. Calling can only be used for payments that were announced with AUTHORIZED state. In case that Client created payment with requirement to preauthorize credit card payment (using the parameter preauth=true), by calling this function says he will not encash the money that were blocked within the preauthorization and thus can be released. Method for refunding paid payments. It is possible to perform both partial (refund amount is less than amount of the payment) and full (refund amount is equal to amount of the payment) refund. That amount will be refunded back to payers account. test string N Value “true” means, that refund will be set as testing. Refund and payment will be checked as usual, but initial payment won’t be refunded. If empty or “false”, refund will be set as production. Testing payments can only be refunded with testing refunds. Method for merchant used for determining his current allowed options in ComGate Payments system. This can be used for getting the list of available methods. These methods can be used for payment creation afterwards. type string N Format of response (“xml” or “json”). If not present, “xml” will be used. lang string N Language of method description. Valid valies are “cs”, “en”, “pl”. If not present, “cs” will be used. XML or JSON is present in response, according to parameter „type“. Both formats have same nesting level. Product is exempt from paying VAT. The reduced rate of VAT. PENDING Payment transaction was created, final result of payment is not yet known. PAID Payer successfully realized payment – it is possible to provide goods, service. CANCELLED Payment was not realized, goods is not delivered, service is not provided. At exceptional cases it is possible for this state to change to PAID state.. List of available payment methods is here.